The signing of both of these Spanish giants was a turning point for Chelsea. Cesc Fabregas has been the puppeteer behind this Blues side, pulling the strings where he sees fit, for the betterment of the team. 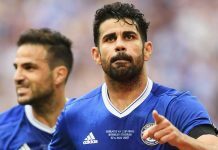 Diego Costa, when fit, has been the most lethal scorer in the Premier League, often finishing the hard work of his compatriot Fabregas. The two have combined to spearhead Chelsea’s attack, coupled with Eden Hazard, of course. Chelsea lost this game at St. James Park. Basically 2-0, short of a last minute goal for the Blues. This match eliminated the expectation of perfection from the Blues. They were able to focus on putting in strong, solid performances, not perfect ones. Newcastle always gives Chelsea a hand full, and the Blues needed to concede a defeat sooner or later. The fact that it came early enough on, made Chelsea able to rebound and finish the job in the latter stages of the season. Chelsea were humiliated by their London rivals on New Year’s Day at White Hart Lane. Mourinho’s men were unable to hold down Christian Eriksen and Harry Kane as the Lilywhites walked all over the Blues backline, spurring Jose to drop Gary Cahill from the side. Although this was a loss, this was a major turning point in the Blues season. It motivated Cahill to work hard and find his form. It also helped Kurt Zouma get some first team looks, which would come in handy for several other big games in the season. Furthermore, this game was one of the last times that Chelsea stuck with their expensive style of play. After this, they locked down, became much more defensive and controlled. The Mourinho style of football would get them through the second half of the season as Champions. Chelsea were close to perfect this afternoon as the Blues executed their plans of stopping Tottenham’s Harry Kane, who caused them nightmares earlier in the season. Kurt Zouma took up a new found position at CDM, next to Matic, and shut down Tottenham’s attack. He played brilliantly and the Blues were able to win their first silverware of the season and Mourinho’s homecoming. This would give Chelsea the confidence they needed to pursue further trophies. While losing in the Champions League in the Round of 16 can never really be viewed as a positive at Stamford Bridge, there is always the same silver lining from this unfortunate occurrence. It allowed the Blues to focus on the Premier League, helping them endure more fatigue and allowing them to prepare for each BPL opponent more closely. Chelsea were able to get a hardfought result against their main title rivals, which helped to maintain Chelsea’s lead over the Citizens. Loic Remy scored for the Blues in absence of Costa and Chelsea’s defense were strong enough to only concede just one goal. Chelsea secured another hard fought victory away from home. The Blues surrendered an early 2-0 lead to the Tigers. However, the Blues stayed in the game, and a late goal from Loic Remy helped rescue the Blues at KC Stadium and allowed them to move three points closer to the title. Chelsea grinded out another tough victory away from home at Loftus Road. The Blues showed their resilience and left it late. Cesc Fabregas scored the winner after a great pass from Eden Hazard. The Blues battled hard and after the 90’ found themselves a step closer to the title. Similar to the QPR game, the Blues won a close game at Stamford Bridge. While they conceded most of the possession, Chelsea were able to find the important goal that separated them from United. Eden Hazard scored through the legs of David De Gea, and put the Blues three points closer to the league. On Sunday, May 3, Chelsea won the Premier League at Stamford Bridge. They did so against a resilient Crystal Palace side, who gave it their best to spoil the party. Chelsea won in true Blue fashion, 1-0. Jose Mourinho ended the game with 3 defensive center midfielders on the pitch, and Eden Hazard was the lone scorer. The Blues finished their title run with a typical Mourinho performance, and held Palace from scoring all afternoon. Next articleWho Needs Bale When We Have Hazard?